The Lions have released veteran running back Matt Asiata, the club announced today. Detroit signed Asiata away from the division rival Vikings in May, inking the 30-year-old to a minimum benefit contract. Always something of a plodder (3.5 yards per carry average for his career), Asiata had a chance to serve as the Lions’ power back if he performed well during the summer. However, Detroit will instead roll with Theo Riddick, Zach Zenner, and Dwayne Washington behind starter Ameer Abdullah. The Steelers made a trio of minor transactions yesterday. According to Mark Kaboly of DKPittsburghSports.com (via Twitter), the team has released long-snapper Kameron Canaday and waived/injured wideout Dez Stewart. Meanwhile, Ray Fittipaldo of the Pittsburgh Post-Gazette reports that the Steelers have signed offensive lineman Jake Rodgers. Stewart was signed to a reserve/futures contract back in February. The wideout was a standout at Ohio Dominican University (Division II), hauling in 196 receptions for 3,197 yards and 25 touchdowns over 43 collegiate games. The receiver was especially expendable after the Steelers selected JuJu Smith-Schuster during last week’s draft. 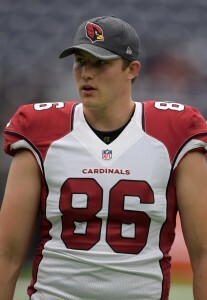 Canaday went from a 2016 undrafted free agent to the Cardinals starting long snapper last season, but he was waived after only three weeks. The Steelers snatched him in February, but similar to Stewart, Canaday was recently squeezed out by a rookie. Pittsburgh selected Colin Holba in the sixth-round of last week’s draft, and the rookie will compete with incumbent Greg Warren for the starting gig. Rodgers has yet to appear in an NFL game after being selected in the seventh round of the 2015 draft. The Eastern Washington product has spent time with the Falcons, Giants, and Panthers. Assuming Rodgers continues to play offensive tackle, he’ll be competing with Jerald Hawkins and Brian Mihalik for snaps.